Most homes are surrounded and supported by concrete, so when concrete sinks it becomes a big—and potentially costly—problem for homeowners, but there are more convenient and budget-friendly options than tear-out and replacement that your Concrete Contractor in Portland at Bridgeport Concrete Leveling LLC can help you with. Sunken concrete slabs, stairs, sidewalks, garage floors, driveways, patios, pool decks, hot tub pads, and basement floors can create dangerous safety and trip hazards, and, because the concrete is not level, homes often experience water leakage in the foundation, basement, and other unwanted areas. The need of concrete repair will also bring down the value of your home and, during a home inspection, insurance companies will make homeowners correct the problem with the help of a concrete contractor before extending coverage. Homes with sunken concrete often find that the ground was not properly compacted before the concrete was poured. Other causes include bad drainage, broken pipes, misplaced down spouts, tree roots, heavy trucks, and burrowing animals. While potential concrete contractor solutions range from slabjacking, replacement, or pouring more concrete to simply ignoring the problem, each requires a different process, time frame, and budget. Slabjacking, also known as mudjacking, concrete lifting, and leveling, is a cost-effective concrete restoration alternative to other solutions with the help of a Concrete Contractor in Portland. Compared to replacement, which creates additional problems such as yard work, fence removal, water and gas issues, permits, and color and texture matching, raising sunken concrete by slabjacking can often be completed the same day. By getting the help of a Concrete Contractor Portland and fixing the problem from underneath—pouring more concrete on top of sunken concrete is not the answer—using a product that sets up like clay rather than concrete, Concrete Contractors can fill the hole or void below the concrete with a product that lasts longer than the original sand and gravel that washed away. This unique process utilizes a 120-foot hose—not a tractor—to pump the slurry into one-inch holes drilled through the concrete. While many Concrete Contractor Portland companies will use a tractor that goes back and forth from the truck to the job, a hose allows for continuous pumping as well as easy access through restricted areas or even through the house. 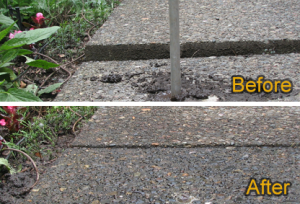 For more information on raising sunken concrete, you can call a concrete contractor at Bridgeport Concrete Leveling LLC, serving homeowners with 12 years experience, at 503-808-0060. CCB #188125.